I think I’ve been on just about every diet known to man. One good thing that has come from all these diets is the great ideas I get from various diet message boards. One such idea was the use of cabbage as noodles. It’s perfect with a tomato based sauce or a pesto sauce. 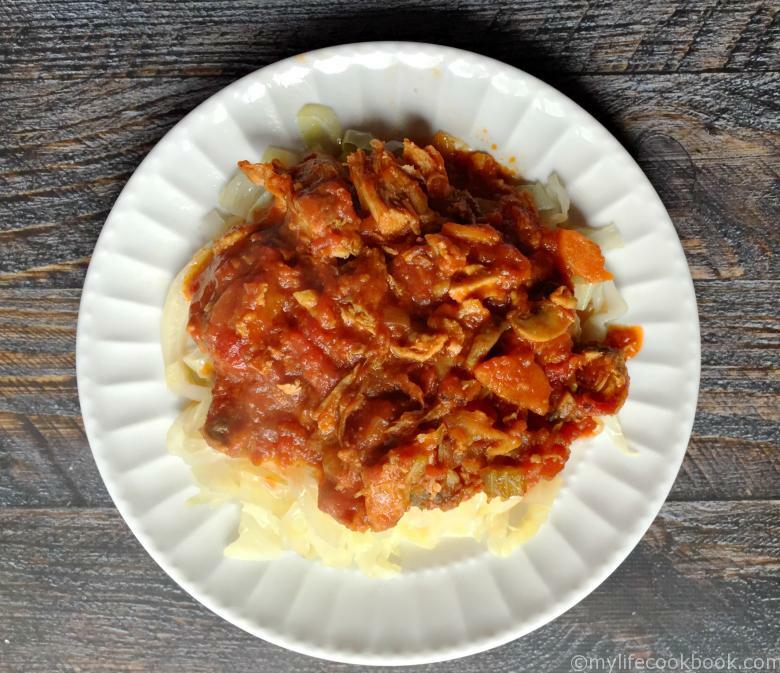 I learned this one from a Paleo or low carb message board years ago and keep forgetting to make it until I decided to make this pork ragu. 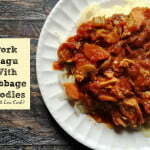 I thought the thick and hearty pork ragu would taste perfect over the soft yet sweet cabbage noodles. 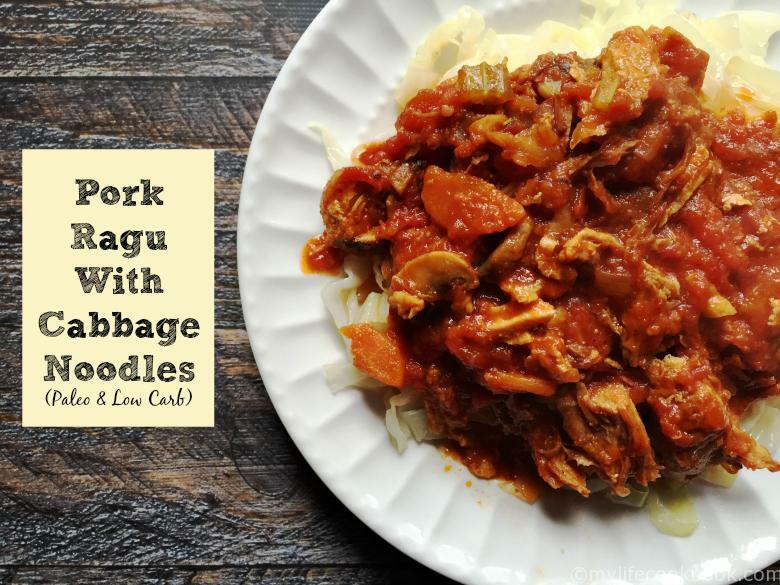 For this recipe I only made enough cabbage noodles for myself so I used 1/4 of a head of cabbage and sliced it real thin. 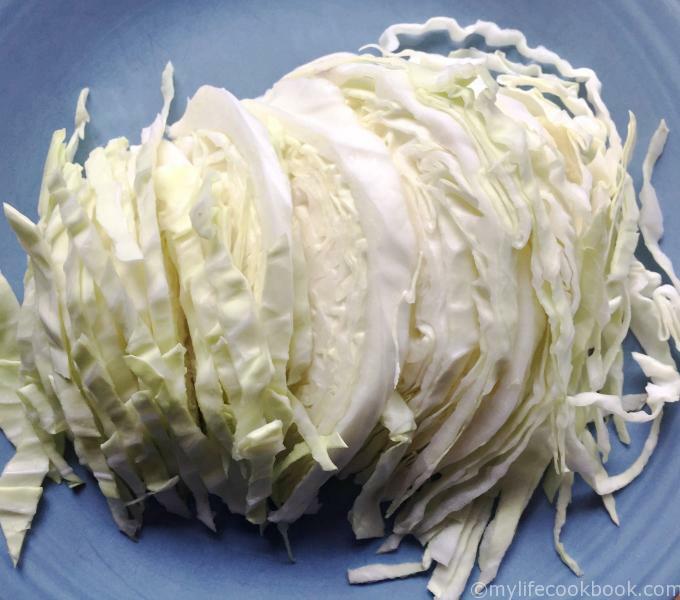 This made one big serving so if you want more, use more cabbage. My family goes along with some of my crazy dishes but not all of them. This is one where they had pasta and I had the cabbage. Fooey to them I say. To make the noodles, you just sauté the cabbage for a few minutes over medium heat with a little olive oil. Turn up the heat to medium high and add a little bit of water, maybe two Tablespoons. Cover the pot and let the cabbage steam. Turn the heat back down to medium and stir. You want to cabbage to get soft but not brown. I’m making it sound more complicated than it is. This is the finished cabbage noodles before adding the pork ragu. Set them aside until the ragu is done. Or better yet, make them when the ragu is almost done so they will be warm when you eat them. The cabbage noodles should only take 5-10 minutes to make. The first thing you want to do is add some olive oil to a dutch oven and brown your pork ribs. Once they are browned, take them out of the pot and set said. Next add your bacon and when it starts to brown, add your veggies. Once the veggies start to soften, add the tomato paste, broth, garlic and tomatoes. Make sure to crush your whole tomatoes with a potato masher, your hands or chop them up. Cover and simmer for about 5 minutes and then add back your ribs and any juices that might have accumulated. Cover and cook over medium low for a few hours (maybe 2 hours). Check it every once in awhile and see how the pork is doing. When the pork starts falling apart, take it off the stove and shred it with two forks. Mix it well into the sauce and put it back on the stove. You can eat it now if you want or let it stew in the tomato sauce for awhile. Taste to check on the seasonings. And here is a picture of the final dish. Of course you don’t have to make the cabbage noodles, you can use your favorite pasta instead. I used a wide pappardelle noodle that I get from Trader Joes for my family and it tasted great. 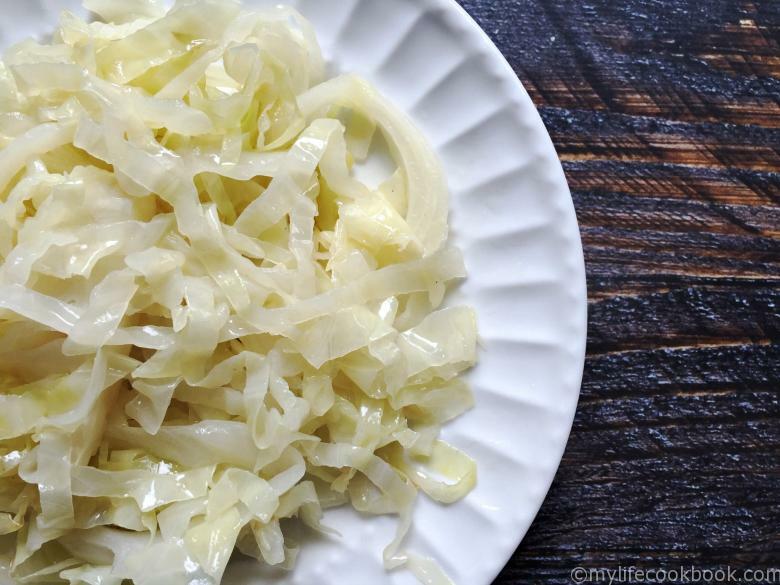 But if you are doing Paleo or watching your carbs, try the cabbage. You might be surprised at how good they taste. Enjoy! Pour your oil in your dutch oven and heat to medium high. Season your pork ribs with salt and pepper and then brown them in the hot pot. Make sure to get all sides. Take out the ribs and put them on a plate for later. Add your bacon to the dutch oven and start to brown. Once it starts to brown, add your vegetables (carrots, celery onions and mushrooms). Once the vegetables start to get soft, add in your broth, tomato paste and tomatoes. Crush the whole tomatoes with a potato masher or just your hands. You don't want big chunks of tomato if you can help it. Add back your pork, put the lid on and simmer on medium low for about 2 hours until the pork starts to fall apart. Shred the pork with two forks and then let simmer for 5 more minutes. Your Pork Ragu is ready to go. Previous Post: « Paleo Clam Chowder with Cauliflower Cream – A healthy, hearty soup! Denise, I made this dish from your recipe. It was sooo good, and my husband LOVED it. It will be a standby. Thanks for a wonderful addition to my recipes! Thank you Jane….you made my day! Looks delicious and healthy which is always a bonus! 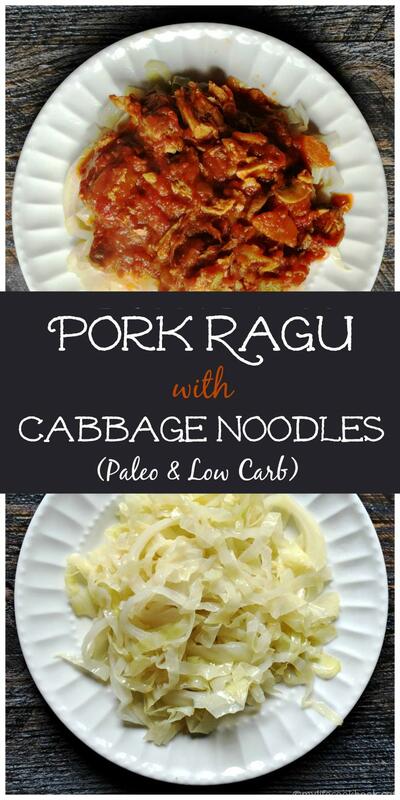 I’d eat the cabbage “noodles” but my family would probaly also do regular pasta! Yes, my family thinks I’m nuts sometimes but they are coming around slowly!